This paper has been developed from some core ideas published for a recent WISE Qatar project (Breakspear, S L, Peterson, A, Alfadala, A and Khair, M S (2017) Developing Agile Leaders of Learning: School Leadership Policy for Dynamic Times). 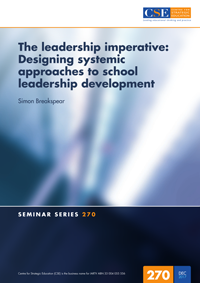 The author’s aim in this CSE paper is to support and accelerate efforts to design, or refine, systemic approaches to school leadership development across a jurisdiction. He outlines the case for a renewed focus on, and investment in, leadership development as a policy priority, and then unpacks five key elements that can shape the design. He concludes with guidance on practical next steps for system leaders.